Gounod’s opera, an 1859 adaption of a portion of the play by Johann Wolfgang von Goethe, originally was not a success in its first production. However, in the subsequent 150+ years, it has established itself as one of the most frequently-performed operas in the repertoire. 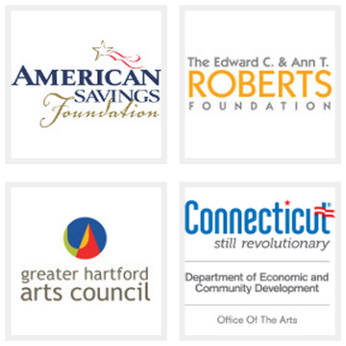 This production by the CLO is not quite traditional, however. The music remains the same; the libretto is sung in the original French, with projected English supertitles. But the setting and characters are transported from the original 16th century Germany to present day Wall Street, with the character of Faust now a highly successful executive at a financial firm instead of an aging scholar. A more familiar face to the CLO’s audience is tenor Daniel Juarez. Juarez, whose involvement in the CLO goes back over five years to his role as Monostatos in the CLO’s 2010 production of Mozart’s “Die Zauberflöte,” performs in the title role for this production. Like Mann, he finds a sense of timelessness in the opera’s main themes, accounting for its enduring popularity and for why it is just as relevant to audiences attending the CLO’s upcoming production as it was to Gounod’s audience 150 years ago: “We’re all human beings, we’re all searching for some type of pleasure. We want to avoid pain, none of us wants to get old, none of us wants our life to be without meaning. I think this is why this opera resonates with audiences and why it’s one of the most popular operas in the repertoire, I think it’s because it does illuminate something about the human condition. There is good, there is evil, we all struggle to make the right decisions. Sometimes, and quite too often, human beings are selfish. And sometimes, in our selfishness we fail to accept responsibility for the consequences of our actions,” just as Faust does. 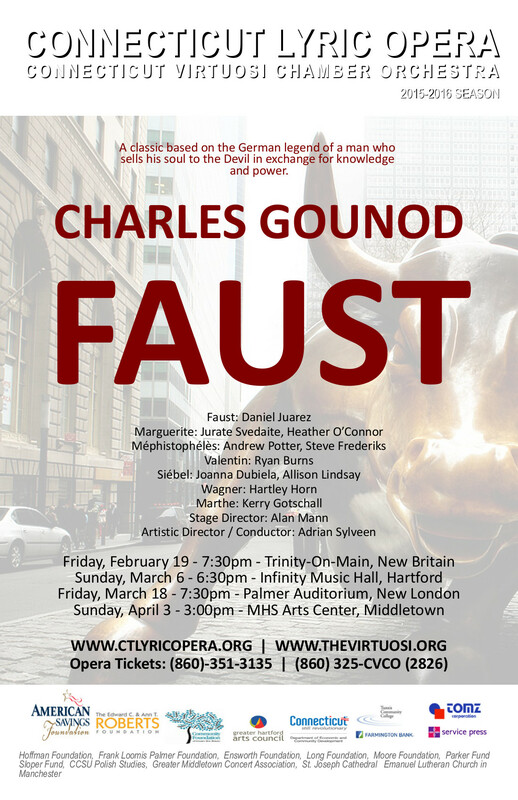 The Connecticut Lyric Opera and Virtuosi Chamber Orchestra perform Charles Gounod’s opera “Faust” on Sunday, March 6th at 6:30 PM, at Infinity Music Hall in Hartford; on Friday, March 18th at 7:30 PM, at Palmer Auditorium of Connecticut College in New London; and on Sunday, April 3rd at3:00 PM, at MHS Arts Center in Middletown. Tickets are available for all performances. 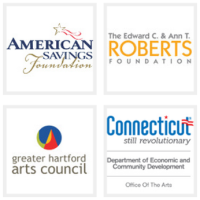 For more information, or to buy tickets, visitwww.thevirtuosi.org www.ctlyricopera.org or call 860-351-3135. Virtuosi @ New Britain Schools: Romanticism Is Not Dead!